A chunky scarf is great to snuggle into on snowy days, but what if it’s just not cold enough for all of that bulk? It’s time to embrace the cowl! The Chic Cabled Cowl is the perfect on-the-go winter accessory. It’s big enough to keep the chill away, but small enough to keep in your coat pocket when the temperature begins to rise. Buttons on the side let you control how warm you want to be, and the cables add a classic texture. For this project I used one of my very favorite yarns, Lorna’s Laces Shepherd Worsted. Shepherd Worsted is a beautiful hand dyed yarn with wonderful stitch definition and great depth of color. It’s also happens to be a superwash wool, which makes it the perfect yarn for outerwear! 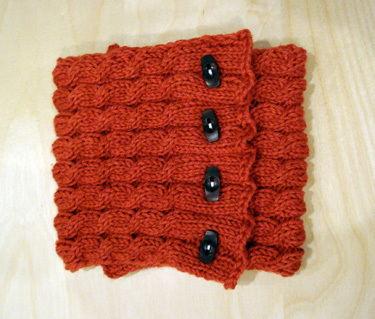 Quicker than a full-sized scarf, the Chic Cabled Cowl is a great first cable project. You can keep the cables even, or add a personal touch by working cables at random intervals throughout. The Chic Cabled Cowl makes a great holiday gift, whether you’re planning ahead or looking for a last-minute knit. C2F place 2 stitches on cable needle and hold to front of work, knit 2 stitches from left needle, then knit two stitches from cable needle. Repeat rows 1-6 until work measures 19 inches, ending with Row 5. Continue in rib pattern for 1 inch. Bind off in purl, weave in ends. Sew on buttons 3 inches from cast on edge. Previous post: Leigh Radford this Weekend! Next post: Meet Robyn Chachula this Weekend! Gorgeous and cabley. What more can you ask for? You are so generous with all your beautiful free patterns. Thank You!!! OH MY GOD! I MADE THIS AS GIFTS FOR THE WHOLE FAMILY AND THEY LOVED IT. THANK YOU. I love the buttons you used! Where did you find/buy them? I think we still have some in the shop. Give us a call or stop in if you’d like to get some. Thanks for this lovely project! I’m starting my first one and love it… Though I am new to cabling and am not the fastest knitter ever, I am getting through this very quickly. Thank you thank you. 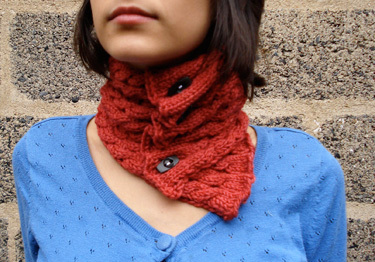 My daughter has been bugging me to knit her a cowl – this will be perfect! I am not sure I understand the button row. binding off and casting on mid row? I am new to knitting and really nervous about this.